En route from an overnight stop in Saarbrücken on the way to Paris to pick up clients, I made a stop at the small city of Reims to check out one of the most famous cathedrals in France. On a quiet Saturday afternoon I had no trouble parking right on the main street leading to the soaring twin towers of the cathedral, quite a sight even in this modern age but imagine what pilgrims must have thought 500 years ago, when the towers would have loomed over the countryside, visible for many miles in every direction. French kings were annointed their heavenly powers here from the middle of the 11th century until the early part of the 16th. What this means, is that the king already had rule over earth. 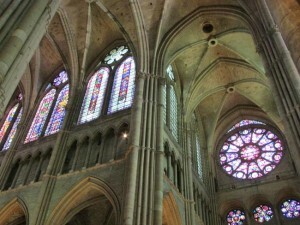 At Reims, he received the right to rule over heavenly matters as well, as God’s own chosen ‘ambassador’ to earthlings. Our Lady of Reims (Notre Dame) rises on the foundations of a much earlier church built in the 4th century on the site of what is suspected to be a Roman bathhouse. The predecessor to this cathedral was damaged by fire early in the 13th century. 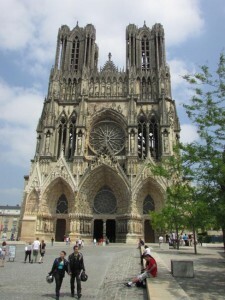 An ambitious building project to rebuild a cathedral which would be mightier than almost any other in the kingdom was aided by the donations of many pilgrims who came to pray at the spot where it is said King Clovis was baptized in the year 496 by Remi, then Bishop of Reims and later declared a saint. The cathedral’s twin western doors were wide open on the day of my visit. Entry is free. The interior dimensions take ones breath away on first sight. 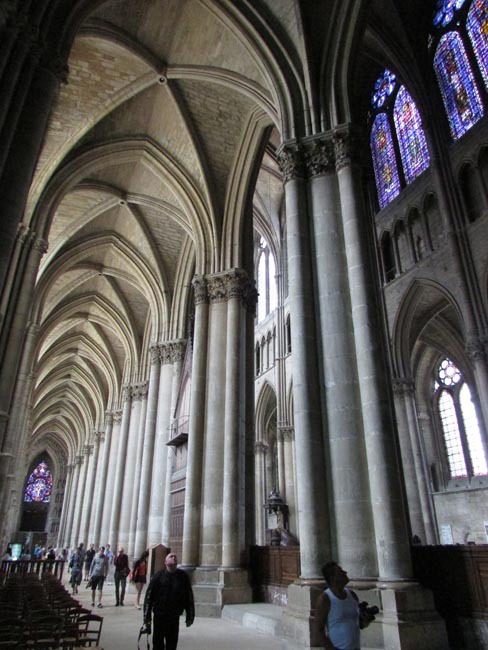 Even though the cathedral has suffered great damage since the main building was finished in 1400, the age of the structure and the history of so many coronations taking place here makes Reims an important stop during any trip through northern France. Joan of Arc was here. 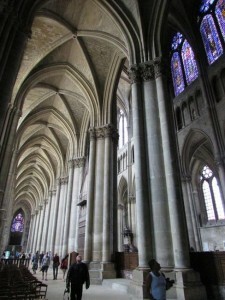 She rescued the cathedral from the English after they had captured it during the Hundred Years War. This took place in 1429. Following her rescue of the church from the English, the Dauphin Charles was crowned king on 17 July. German shellfire during the opening engagements of the First World War on 20 September 1914 burned, damaged and destroyed important parts of the cathedral. Scaffolding around the north tower caught fire, spreading the blaze to all parts of the carpentry superstructure. The lead of the roofs melted and poured through the stone gargoyles, destroying in turn the bishop’s palace. Images of the cathedral in ruins were used during the war as propaganda images by the French against the Germans and their deliberate destruction of buildings rich in national and cultural heritage. Restoration work began in 1919, under the direction of Henri Deneux, a native of Reims and chief architect of the Monuments Historiques; the cathedral was fully reopened in 1938, thanks in part to financial support from the Rockefellers, but work has been steadily going on since. 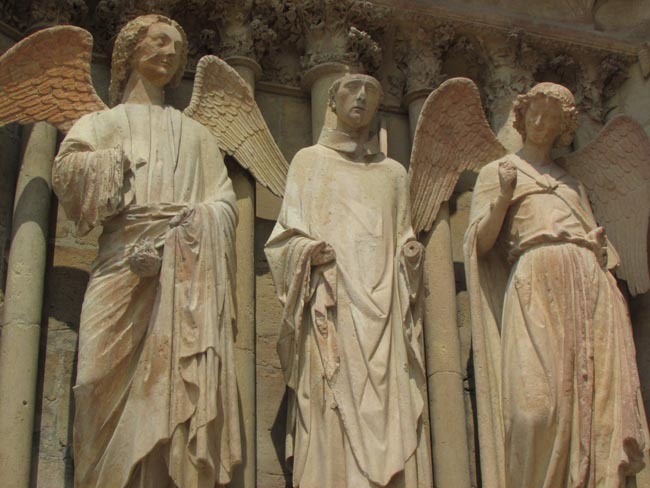 Posted in France Tours and tagged ages, cathedral, crownded, french, in, kings, middle, northern, paris, private, reims, tour, visit.